'Tis the season. The colder days are coming, leaves are changing. Or so I hear. In Texas it's just slightly cooler than it was at the height of summer. 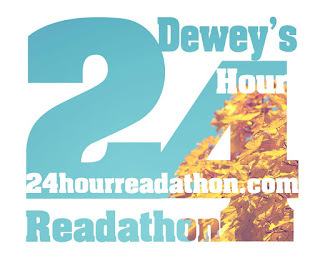 It's also time for the Dewey's 24 Hour Readathon to ramp up behind the scenes, and I thought I'd share this step-by-step, phase-by-phase process with you all this year. Why? I dunno. Someone might think it's interesting. Someone else might want to jump in and help. Someone might just decide to read with us for the first time. Undertaken a website re-design. For the first time we actually own the Readathon website, which was previously owned by Trish from TLC Book Tours who was an early participant and steward of the Readathon. Taking over the website means a transition and some redesigning. Thank God Heather is really good at this stuff. See seasonal logo above! I was a total bum last April and never did a wrap-up post, soooo now we're scrambling a bit to get a rough list of people who might want to volunteer. Speaking of that, you can express your interest here! Meanwhile, we're reaching out to our Goodreads moderators. Two of the three will be largely unavailable for this event, so we have some recruiting to do! I'm already using Buffer to schedule out social media reminders. We do a good bit of live Tweeting but some standard posts have to go out, too! We've calendared out our sign-up posts. Reader sign-ups go live on September 18 with cheering, mini-challenges, and prize donations to follow, as needed! We've been thinking since last year about the issues that MUST be addressed! Namely, the way we cheer and the way we award prizes. There just aren't enough cheerleaders for 1,500+ readers, and we can't always trust the prize donors to follow through (I'm looking at you, publishers who flaked!). We have plans, plans, plans. Surprises and plans. We'll roll out more here as the time comes! I'm planning to participate for the first time this fall...I won't get nearly the reading done that everyone else does with 2 little kids at home, but I'm going to just give it a go anyway and not put any pressure on myself! I'm looking forward to it! Thanks so much for all your work organizing! Oh yay! We're glad to have you for the first time. Amen to not too much pressure! I really had a good time in the last readathon, but work is kicking my tail. So, I won't be able to participate this time. :( Best of luck to you, and I hope you accomplish your goals! I'm so glad! I know all about work kicking tail. Hang in there and we'll miss you during readathon! I'm quite fascinated with this look at the behind the scenes! I've said it before, but I have no idea how you to do this event twice a year. It has gotten SO big that the logistics are just overwhelming to me. You do an excellent job though, as seen by its size. I just admire your passion and commitment. You do the book reading community proud! Wow I didn't realize so many people participated. You must feel insane after it is all over and done. Whoa. Last year was my first time participating. Hopefully, this year's job schedule will allow for full participation as well. I haven't participated in the Read-a-Thon in a while and I miss it. Love it!